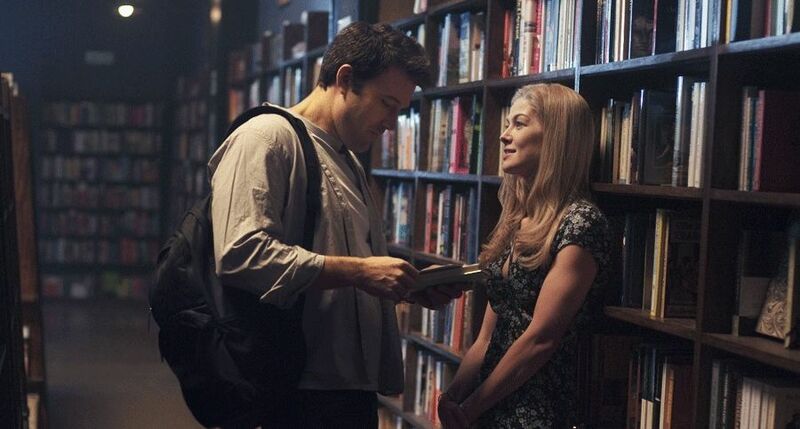 Gillian Flynn’s hit crime novel “Gone Girl” is great fun but it turns out the book’s huge plot twist is such a vital part of its enjoyment that many who enjoyed it will find the film a disappointment. Those who have not read it most likely will find a steady build-up in tension with several flashbacks as it moves towards the important reveal some time into the picture. Those who have might find it a little flat and the remainder rather dull aside from the acting. Flynn has delivered a faithful screenplay and director David Fincher provides his usual attention to small detail and keen sense of dread but while the book is a thriller underpinned by a savage examination of marriage, the film is less a murder mystery than it is “The War of the Roses”. It’s marriage as bloody hell. Ben Affleck and Rosamund Pike play Nick and Amy Dunne, successful New Yorkers who are forced to move back to small-town America when their jobs and money run out. She’s a trust-fund baby and he’s a lacklustre writer and when her trust is emptied and he is forced to work in a bar, the exciting Manhattan ties that bound them together begin to unravel. When perfect Amy goes missing, circumstantial evidence leads local police led by Det. Rhonda Boney (Kim Dickens) to suspect that Nick might have killed her. It doesn’t help that his demeanour is so off-putting that he alienates just about everybody. When Amy’s diary and friends unknown to Nick begin to surface, the evidence appears to mount until the whole picture changes suddenly with a revelation that will surprise many. Affleck makes Nick suitably second-rate while Pike cements her move to the big time with a performance that Alfred Hitchcock would have adored. Pike starred in a play in London in 2003 titled “Hitchcock Blonde”, and she is the perfect ice cold beauty with devastating fire inside. The rest of the cast are mostly solid. Dickens makes her detective appealing but Neil Patrick Harris is unconvincing as a former lover of Amy’s who is very rich but possibly unhinged. For readers of the novel, the implausibilities in the plot become exposed in the film, not least its prime motivation. The movie suffers, too, from the over use of the clumsy device in which whenever someone turns on the television there’s a news story about the crime. In this case, everyone everywhere appears tuned all the time to a sleazy Fox News type presenter named Ellen Abbott (Missi Pyle ) to indicate the swings of public opinion. Far worse is the presence of a simply awful electronic score by Fincher regulars Trent Reznor and Atticus Finch. It drones and undercuts scenes on a regular basis. Randy Newman told me once that a great score cannot save a bad movie but it can raise its IQ by a couple of points. This is a case where the music takes it down a peg or two. Opens Oct. 3 UK and US, 20th Century Fox. 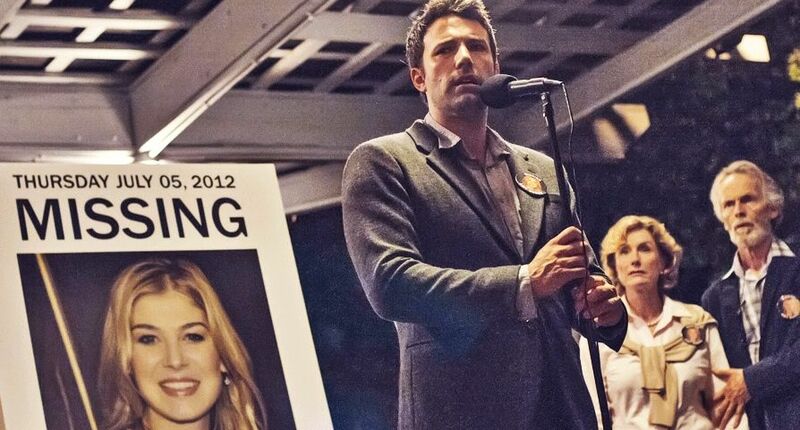 Cast: Ben Affleck, Rosamund Pike, Neil Patrick Harris, Tyler Perry, Margo Dunne, Kim Dickens, David Clennon, Lisa Banes, Missi Pyle, Emily Ratajkowski, Sela Ward; Director: David Fincher; Writer: Gillian Flynn, based on her novel; Director of Photography: Jeff Cronenweth; Production designer: Donald Graham Burt; Music: Trent Reznor, Atticus Ross; Costumes: Trish Summerville; Editor: Kirk Baxter; Producers: Ceán Chaffin, Joshua Donen, Arnon Milchan, Reese Witherspoon; Production: Artemple-Hollywood, New Regency Pictures, Pacific Standard, Regency Enterprises. Rating: UK: 18 / US: R; Running time 149 minutes. This entry was posted in Film, Reviews and tagged 'Gone Girl', 20th Century Fox, Atticus Ross, Ben Affleck, David Fincher, Kim Dickens, Rosamund Pike, Trent Reznor. Bookmark the permalink.